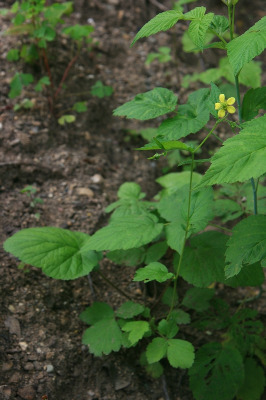 A Eurasian weed, locally established at edges of thickets and disturbed, young forests, especially along trails; a yard and garden weed. First collected in Washtenaw Co. by A. A. Reznicek in 1978. A 1927 collection from the University of Michigan Botanical Gardens notes "from Sweden" and may have been from cultivation. This hybridizes with the native G. canadense to form G. ×catlingii J.-P. Bernard & R. Gauthier, with pale yellow petals (but much longer than those of G. virginianum). This has been confirmed from Calhoun and Washtenaw Cos., but is doubtless overlooked. A peculiarity of the hybrid is that the inflorescences may continue to grow, sometimes forming an elongated tangle. MICHIGAN FLORA ONLINE. A. A. Reznicek, E. G. Voss, & B. S. Walters. February 2011. University of Michigan. Web. 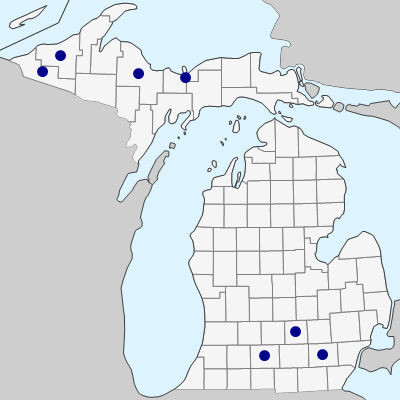 April 21, 2019. https://michiganflora.net/species.aspx?id=2490.